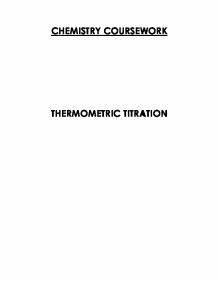 CHEMISTRY COURSEWORK THERMOMETRIC TITRATION Aim The purpose of this experiment is to determine the concentrations of two acids, hydrochloric acid, HCl, and ethanoic acid, CH3CO2H, by thermometric titration; and having done that, to calculate the enthalpy change of neutralisation. Introduction You titrate both hydrochloric acid and ethanoic acid in turn with a standardized solution of sodium hydroxide and record the temperatures of the mixtures during the course of the titration. 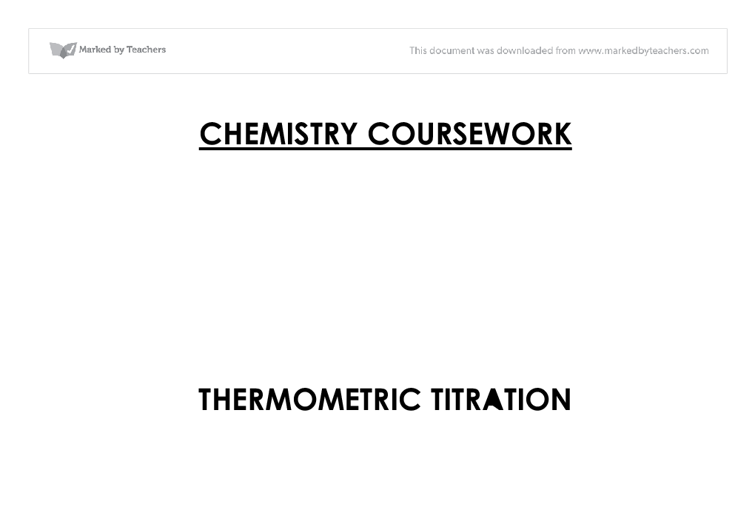 In each case a plot of temperature against time will enable you to determine the maximum temperature rise, from which you calculate both the concentration of the acid and the enthalpy change of neutralisation. Requirements * Safety spectacles * Pipette, 50.0 cm3 * Pipette filler * Expand polystyrene cup * Sodium hydroxide solution , 1 m NaOH (standardized) * Thermometer, 0-50 C0 (in 0.1 C0) * Burette , 50.0 C0 cm3 * Filter funnel , small * Hydrochloric acid , M HCl * Ethanoic acid, M CH3CO2H Safety/risk assessment: During experiment in laboratory extreme care should be taken to avoid any hazards. ...read more. 4. Stirred the mixture with the thermometer and recorded its temperature. 5. Added successive 5.0 cm3 portions of HCl solution stirring the mixture and recording its temperature after each addition. 6. Recorded my results in a copy of result table 14a. Stopped after addition of 50.0 cm3 of acid. Titration of ethanoic acid with standard sodium hydroxide solution 7. Followed the same procedure as I did for the titration of HCl, except that I used ethanoic acid in the burette. When filling the burette, I had to remember to use to correct rinsing procedures. 8. Recorded my results in a copy of results table 14b Results Table 14a, Titrations of hydrochloric acid. Volume added/cm3 0.0 5.0 10.0 15.0 20.0 25.0 30.0 35.0 40.0 45.0 50.0 Temperature/C0 24 27 29 31 32.5 33 32.5 31 30.5 30 29.5 Volume added/cm3 0.0 5.0 10.0 15.0 20.0 25.0 30.0 35.0 40.0 45.0 50.0 Temperature/C0 24 27 29 30.5 32 32 31 30.5 30 30 29.5 Results Table 14b Titrations of ethanoic acid. ...read more. A s long we are considering a strong acid reacting with a strong base , we always dealing with the same reaction; H+ (aq) + OH- (aq) H2O (l) This is because strong acids and bases are assumed to be completely ionised, that is why the value is always constant. 2. Hydrochloric acid is less negative than -57 kj mol-1 because: * Energy was lost to the surrounding because the polystyrene cup was not good insulator. * Secondly, heat escaped through the hole of the polystyrene cup where the thermometer was inserted to take the temperature reading. 3. Weak acids and bases does not fully ionise when they dissolve in water. Ethanoic acid is typical example of a weak acid. It reacts with water to produce hydroxonium and ethonate ions, but the back ward reaction is more successful than the forward one. When ethanoic acid react with water only view percentage of the cid is converted into ions. ...read more. must be between 0.05 and 0.15. From these numbers, and in order to work as accurate as possible, we will assume that we can titrate is with 0.10 M concentration of sodium carbonate. Also, we know that we want finally to obtain 250 cm3 of the solution. x 100] 1000 This would give you the amount of grams of X2Y3 required, with the rest of the solution being made up with distilled water. Pre-test Firstly I have decided to use burettes rather than measuring cylinders for measuring out my solutions. 14. Now, I will start my titration. However, my first titration is going to be a rough titration. I will slowly add the sulphuric acid along with swirling the conical flask to mix the contents. When I have a slight colour change, I will stop adding more sulphuric acid. does not oxidize oxalates in cold solution. A temperature of about 70�C is necessary to provide the activation energy for the reaction to proceed and to cause the reaction to occur rapidly. 5) Pipetting of 10 cm3 of the oxalate solution must be done with special care. 3 of the major plant nutrient requirements for survival are: nitrogen, potassium and phosphorus. Phosphorus is vital for plant growth; it is a component in ATP which provides the energy for all the biological processes that occur within the plant.